There are certain moments in blogging which stand out for me. When I set up my very first blog seven years ago, when I first collaborated with a brand, going self hosted, registering as self-employed and then there are opportunities like the one I experienced yesterday. 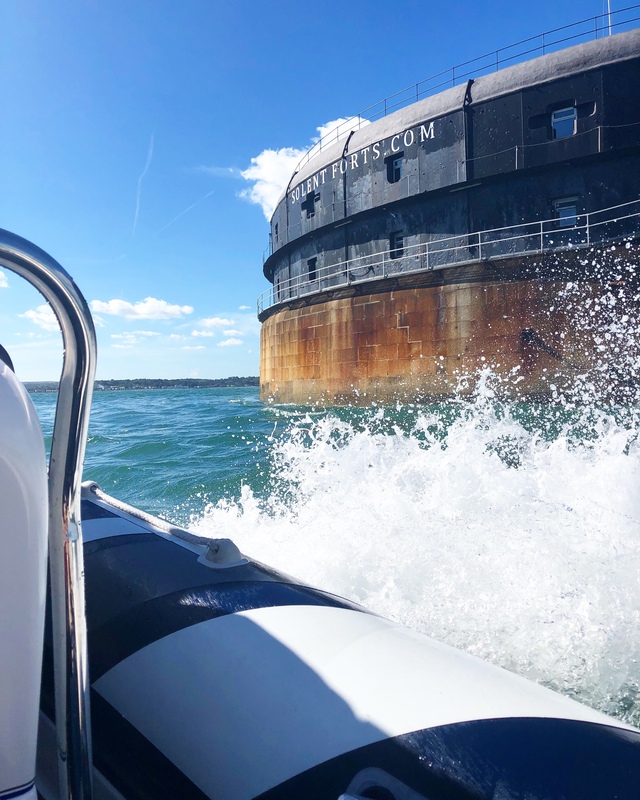 I was invited to join a few other bloggers on a day out with Solent Forts to experience their luxury hotels first hand and it was definitely a pinch me moment. If you haven’t heard of Solent Forts before, they are situated out at sea, off of the coast of Porstmouth and are historical monuments that have been converted into luxury accommodation. There are three forts in the group – Spitbank (the smallest), Horse Sand and No Man’s Fort, which was my favourite. I went into the day not really knowing much about the forts, so it was not only amazing to be treated to the brilliant hospitality but also really interesting to find out more about the background of these rather unique venues. We started our day at Gunwharf Quays, where we met at the Solent Forts offices down by the harbour. After some introductions, we headed over to board our rib boat, which would be taking us over to Spitbank Fort and then on to No Man’s Fort. Regular readers will know that I suffer quite badly with anxiety, and the feeling of being unable to get off of something once I am on it terrifies me. I was very uneasy about getting on the boat as it was quite small and from photos I had seen online, I wasn’t entirely sure how I would cope once on it. Fortunately the team and my fellow bloggers were totally understanding and made sure I was feeling happy and confident as we made our way out to sea. Although a little daunting, once we got going it was actually quite fun and definitely added to the experience! When travelling to the forts, guests travel by a bigger, more commercial boat, which we went back to shore on at the end of the day. The rib boat ride is available as part of some of the packages or can be added on to a booking for an additional cost. Arriving at Spitbank Fort, we were helped off the rib by friendly members of the Solent Forts team and greeted with a glass of champagne, which was much appreciated. Sipping on our drinks, we were led around the fort and given a guided tour, explaining the history and allowing us to explore the bedrooms, bars and communal areas. Spitbank is the smallest of the forts with eight bedroom suites and four function rooms for up to 60 guests whilst No Man’s is considerably larger with 23 bedrooms and seven function rooms (suitable for up to 200 guests). Both hotels are available for exclusive use, corporate and private hire, weddings and events. Currently day trips to Spitbank are only available when booked with their Sunday Lunch and are priced at £125 per person including return boat transfers, four course lunch and a tour of the fort, with lots more options when it comes to No Man’s. After our tour of Spitbank we took the rib across to No Man’s and were again welcomed with a glass of bubbles before being shown around the, much larger, fort. Every member of staff we met welcomed us with a smile and were keen to make the experience as special as possible. I got the sense that nothing was too much trouble and that the team would be prepared to go out of the way to provide a first class experience for each and every guest. We were fortunate to be able to have a look around several of the bedrooms across the two forts including the bridal and presidential suites, which were both incredible. The presidential suite on No Man’s was massive with a generously sized dining and lounge area, bathroom and master bedroom complete with a freestanding bath, which Alice posed for photos in, us bloggers are all about the insta-worthy snaps! As well as the larger suites, Spitbank and No Man’s have a collection of standard bedrooms, all comfortably furnished and with en-suite bathrooms. It is possible to book a selection of ready-made packages including the popular 24-hour fort adventure, including overnight accommodation, return boat transfers, a tour, lunch, dinner and breakfast as well as use of the facilities. If you are looking for something a little more unique, it is possible to create your own bespoke package or upgrade to make a stay extra special. As well as the bedrooms, there are several communal areas available for guests to use throughout their stay. On No Man’s there is a cabaret lounge, pool and snooker rooms, a comfortable lounge for enjoying tea and cake in and there are plenty of bars and seating areas around both of the forts. There are also facilities available for hotel guests, included in most of the overnight stay packages. I wanted to stay over just to experience the rooftop hot tubs, hot house & fire pit where you could sit and enjoy a drink as the sun went down. As we explored, I felt there were similarities between the forts and a cruise ship. Although the forts don’t move, the sheer size of No Man’s especially, and the amount of activities on offer, paired with the location in the middle of the sea really gave it that cruise ship feel for me. Although we only visited for a day and unfortunately weren’t able to stay overnight, the trip is an experience I won’t forget for a long time. I have been to plenty of museums and historical places of interest before (my mum is a teacher and we spent many a summer holiday exploring National Trust and English Heritage properties) and have been fortunate enough to explore other luxury accommodation but I have never experienced the two together. I mentioned during our tour of No Man’s that it was so strange how some areas of the fort smelt musty and although I possibly didn’t articulate what I meant very well, I found it fascinating how the forts have been adapted into an incredible hotel with luxury trappings, whilst still keeping that authentic historical aspect alive. I was in awe as we explored and must have said wow a hundred times, finding something even more incredible around each corner. The lighthouse at No Man’s was a personal favourite area of mine. Not brilliant for those with a fear of heights due to the glass flooring, I found myself mesmerised by the incredible views and beautiful design of each level as we made our way up. Also, fun fact – you could totally see our dining table if you were exploring the lighthouse, which I discovered whilst exploring after we had eaten! As a mum of three, spending the day away from my children, I was quite relieved to find out that the forts are not suitable for children under the age of 12 for a day trip and under 18 for an overnight stay, which gave them an almost adults-only vibe, something I can totally get on board with. Don’t get me wrong, I love my kids and it’s nice to experience some things with them, but it can also be nice to spend some quality time away together as a couple and I will definitely be looking into booking to stay at some point with Ed. If you have an interest in history, the forts are definitely for you. With a varied history over the past 150 years, you can get a real insight into how the forts played a part throughout the French invasion led by Napoleon and both the first and second world wars. The forts are still steeped in history today, with plenty of artefacts and hidden treasures to discover during your time ‘on board’. There are even guns on display and the chance to experience history first hand with a game of the Hook & Ring Challenge on Spitbank. The third of the trio, Horse Sand Fort, is the only one we didn’t have a look around, but is a living museum. The same size as No Man’s, it showcases the history of the forts with 100 chambers and living quarters. It is impossible to write about our visit without mentioning the food. After being shown around both forts, we were treated to a private three-course lunch in the Lighthouse and it was absolutely incredible. I am not a huge foodie, in the sense that I love food, but I can be quite picky and there have been times when I really haven’t liked what I would refer to as ‘fancy’ food. The food at Solent Forts was most certainly fancy, but it was also totally delicious. I will admit I wasn’t as keen on our starter, which was a pheasant and girolles terrine (I am not a terrine fan in general), but I found the main course of pan fried corn fed chicken absolutely delicious and the autumn pavlova dessert was as tasty as it was insta-worthy. As well as the food, our glasses were topped up with wine throughout the meal by a lovely member of waiting staff who was around for anything we needed but discreet, allowing us to relax and enjoy the meal with the sound of the sea and a gentle playlist in the background. It was one of the nicest meals I have had in a long time and I must come back just to eat there again! After our lunch, we were able to have another look around No Man’s and explore the different areas, but first we were treated to a lovely hand and arm massage by the spa therapists. There are plenty of activities available to make a stay extra special including a full list of spa treatments, fishing, wine and cheese tasting, a trip on the rib and cocktail making. No Man’s is the perfect place to celebrate a hen or stag weekend with rum tasting, a champagne sabrage experience, treasure hunt all on offer. There’s even a lazer battle labryinth laid out over one whole floor of the fort! The whole day was incredible, but I think one of my favourite parts was taking photos (no surprise there) and there was plenty to take photos of! Not only does the fort itself provide the perfect backdrop, but the panoramic views around the forts take your breath away. We were so, so lucky with the weather after the wind and rain leading up to our trip, and the blue skies and sunshine definitely added to our experience but I equally think that a nice moody sky would make for some lovely shots too (you might just prefer heading in to the bar rather than being outside). It is worth noting that obviously due to the nature of the hotel, it can sometimes be unsuitable for travel to and from the fort. In the case of adverse weather, Solent Forts assure that bookings will be changed or fully refunded where necessary. I absolutely loved my day with Solent Forts, it was so lovely to spend the day with some other fantastic bloggers, and I would 100% recommend visiting, whether for a day or to stay over. Although fairly high, I think the price is justified and packages like the Trio of Forts Experience, which is priced at £400 per person offers great value for money with a two night stay, all boat transfers, an afternoon aboard Spitbank Fort with buffet lunch and tour, a historic tour aboard No Man’s Fort, a rib ride around the three forts, a three course dinner each night and breakfast each morning! I will be looking into booking either for a birthday or for our next wedding anniversary as Ed has already said how much he would like to go having looked at my photos and clips from the day. To book or enquire about a stay, visit the Solent Forts website or call 02392 809 767. Solent Forts have kindly given 10% off to my readers with code EMMAL10 (valid until 5th November 2018).